While walking through the woods, Casey is intent on discussing which Olsen twin is the hottest (something Raph would rather not think about at his age). Suddenly, a meteor crashes into the forest and they run over to investigate. What they find in the smoking crater is a flying saucer of the George Adamski persuasion. 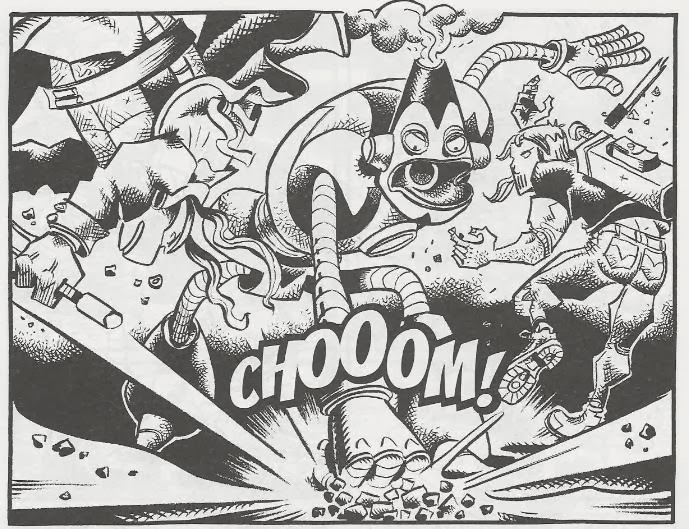 The saucer opens and out stomps an angry robot with an exhaust pipe on its head. 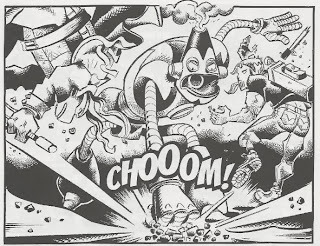 The robot immediately attacks them with its extending arms and laser eyes. Casey puts on his hockey mask while Raph pulls out his sais and the two fight back. After breaking their weapons on the robot’s impervious armor, they realize they may need a better strategy. As the robot flings Raph into a pond, Casey comes up with an idea. Grabbing a rock, Casey dodges the laser eyes, leaps into the air and slam-dunks the stone into the exhaust pipe on the robot’s head. And that brings us up to speed. The spooks are pleased with Casey’s story and slip him a briefcase. However, they want to know why he was so nonchalant when going face-to-face with an alien. Casey rolls his eyes and insists that EVERYONE knows aliens are real, so what’s to be afraid of? The spooks seem even more pleased with that response than the preceding story and give him a lift home on their helicopter. The chopper drops Casey off on the roof of his apartment building. Raph is waiting for him and wants to know what happened. Casey tells Raph that movie rentals for the night are on him and displays the briefcase of cash. Back at the unknown facility, the spooks reveal that they aren’t affiliated with the Government at all: They’re Utroms! Thanks to Casey Jones’s testimony, they have determined that the Earthlings are ready for First Contact. As an aside, Rogro compliments Glurin on his design of the robot. Glurin thanks him and says he was inspired by Earth’s cartoons. *According to the opening editorial, this story takes place 3 weeks before TMNT (Vol. 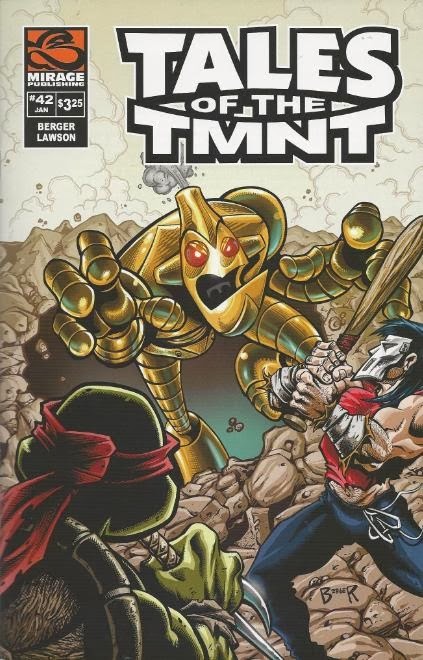 4) #3, which would actually put it shortly before TMNT (Vol. 4) #1, considering how densely serialized those earlier Volume 4 issues were. *The Utroms will initiate First Contact in TMNT (Vol. 4) #5. *Chronologically, Glurin will appear again in Tales of the TMNT (Vol. 2) #18. *This issue also featured a bonus pin-up, “Cats and Dogs” by Chris Herndon and Dan Berger. You know, I really wish there were more of these light comedic issues of Tales of the TMNT Volume 2. They’re a fun break from all the heavier storytelling, that’s for sure, and even though some of them fit into a larger overarching narrative (as this one foreshadows events in TMNT Volume 4), they’re still good standalone reading. 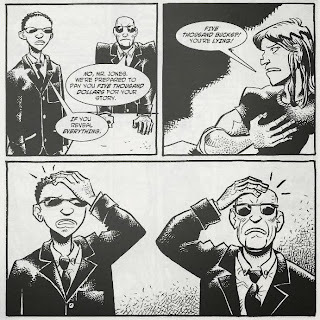 Moreso, I really like it when Lawson applies a more exaggerated, cartoony style to his characters. As with “Spinal Tapped”, “The Curious Case…” is a good example of how much more energy and animation his pencils have to offer when he isn’t taking himself or the story too seriously. The "skull and crossbones" dialogue boxes from the robot were a nice throwback to the Foot Super Soldiers from the Archie TMNT Adventures series (who also "talked" with such symbols). I’ve only spoken to Berger a couple of times, but he’s always struck me as a guy of good humor (and patience), and you can see that attitude in most of the stories he’s written. While he’s offered some of the darkest and most profound tales in the TMNT catalog, he’s also penned a number of the goofiest and most entertaining. There’s fun to be had in Casey’s narration, as he fumbles with things like covering up who Raphael is (trying to come up with a “full name” and only managing to squish the other TMNT’s names together). There isn’t a whole lot else to talk about in this story. 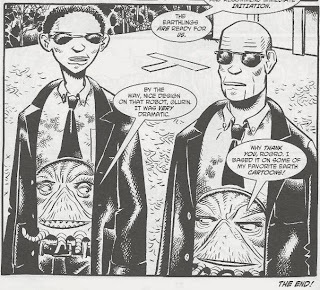 It foreshadows the First Contact event that would define much of TMNT Volume 4 and, I think, marks the first chronological appearance of Glurin, whom we’ll see much of in the Volume 4 era (both in TMNT and in the Tales issues set during that timeframe). I do wonder about Glurin’s decision to test out the robot on Casey Jones, of all people. Surely he must have been aware that Casey doesn’t qualify as an “average” Earthling, at least when it comes to how he’d react to aliens and monsters and stuff. But perhaps that was part of Glurin’s strategy all along; purposely choosing a test subject he’d know to be okay with the idea of aliens because it might speed along the decision to initiate First Contact. Anyhow, this is a rather unassuming story and it’s comic relief, no doubt, but its humor is well staged and I think Lawson’s contemporary style is at its best when it isn’t taking itself seriously. And yet another era of Mirage TMNT is completed. 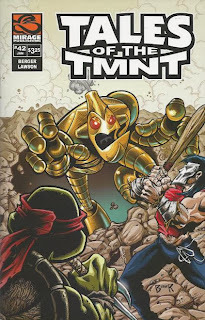 I would like to see reviews of the Sushi Turtles one-shots and shorts, some of the other Turtle Soup shorts, and/or the Haunted Pizza, Maltese Turtle, and Times Pipeline specials before you jump headon into the Volume Four era, if you're interested, that is. ^ What are you talking about? He still has around 10 or so issues of Tales V. 2 that he hasn't reviewed yet. But yes he should review Volume 4 last for obvious reasons as the whole thing is continued and it doesn't even have an ending yet. I do remember enjoying this issue, although I was very disappointed that Berger didn't handle art duties after enticing me with that epic cover.